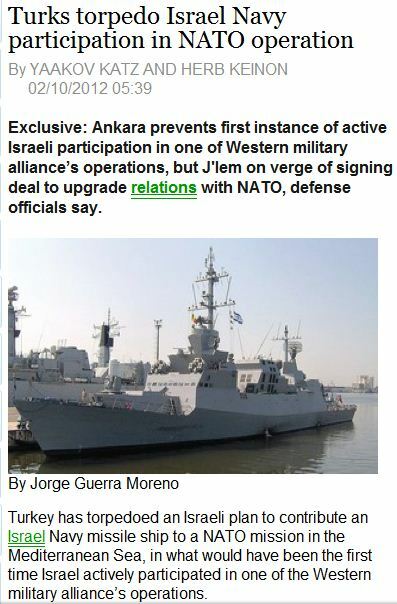 TURKS MANAGE TO NIX ISRAELI PARTICIPATION IN UPCOMING NATO EXERCISE…….. – The Tundra Tabloids……. TURKS MANAGE TO NIX ISRAELI PARTICIPATION IN UPCOMING NATO EXERCISE…….. Diplomatic and defense officials told The Jerusalem Post on Thursday that Turkey had decided to prevent Israeli participation in the long-term operation – called Active Endeavor – following the Israel Navy raid on a Gaza-bound flotilla in 2010 in which nine Turkish nationals were killed. NATO launched Operation Active Endeavor in the wake of 9/11 and has succeeded in bringing together a number of countries to patrol the Mediterranean and share information concerning terrorism and suspicious ships. In 2008, Israel sent a navy officer to sit at the operation’s headquarters in Naples and in late 2009, Defense Minister Ehud Barak submitted an official request to NATO to contribute a missile ship to the mission. In 2010, Israel and NATO signed an agreement that was supposed to pave the way for the ship’s participation. Previous Post Previous Post ANARCHIST-MARXIST-STATIST ‘ANONYMOUS’ GROUP GOES AFTER ISRAEL WITH PROTOCOLS OF ZION FORGERY SCREED……. Next Post Next Post GERMAN MAYOR WHO APPROVED OF ANTI-SEMITIC CARTOON GETS SLAMMED FOR IT…….